Skills and abilities: Skilled martial artist. Powers: All her physical attributes have been enhanced beyond peak human by the heart shaped herb and a connection to Bast The Panther God. Her true identity is unknown but she came to power after the world was ravaged by meteors leaving Africa the world’s preeminent superpower. Africa was divided between Queen Ororo and the Black Panther herself. She however wanted to control everything and along with her team “Bloodforce” went to was with Atlantis. She managed to capture king Namor, queen sue and their children; Erin (daughter), Ari (daughter), Johnny(son); Unfortunately for her she missed Valeria Fen and, Gambit who joined forces with the realty hoping Exiles and thwarted their plans after siding with Queen Ororo. Years later she succeeded in killing King Namor leading to Gambit becoming the new king of Atlantis. 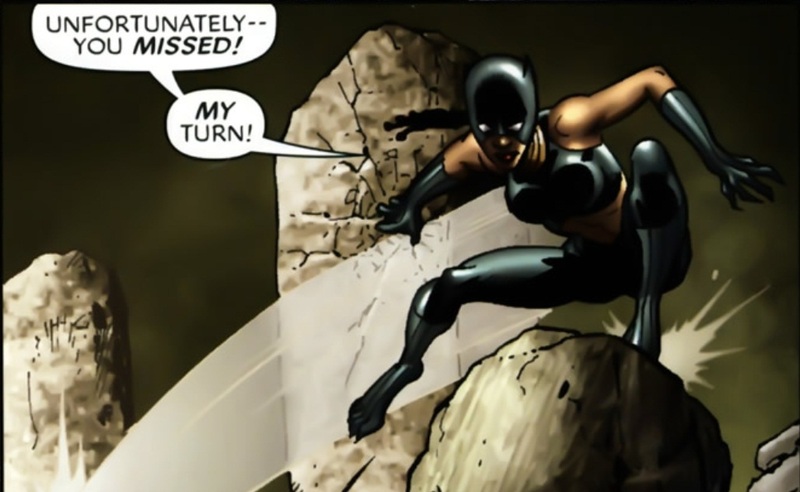 A a female Black Panther and speculation of age it’s theorized that this is an Alternate timeline version of Shuri the sister of Black Panther/T’challa.